Many years back, on the deck of a ferry bound to England, I observed a man in rapt concentration. Sidling close, I saw that his eyes were riveted on a small book, its pages filled with rows of numbers. Being hyper-inquisitive (read, 'nosey'), I asked what it was. He told me he was studying a ringing method. From my blank look, he no doubt realized I hadn't a clue what he was talking about. So, for the next hour or so, he initiated me into the peculiarly English mysteries of Change Ringing (also called Method Ringing). I've been fascinated with the subject ever since. My story, The Teller of Time, is largely concerned with the 'science' (or exercise, as it is called) of Change Ringing. I'm pleased for the opportunity to here explain some of the possibly obscure ringing terms in the story—and also to give a short introduction to ringing itself. 'Teller' is a word for a tolling bell—usually the lowest pitched bell in a ring (note: a 'pack' of dogs, a 'sheaf' of papers, a 'ring' of bells). This story first appeared in Analog Magazine, Jul/Aug 2006. 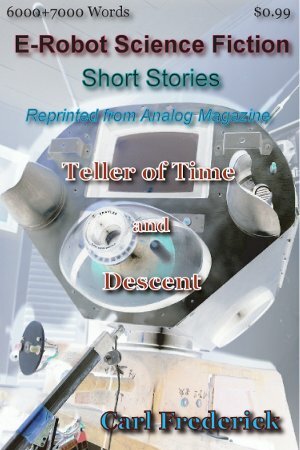 'Man Descendent' was the original title of the story when it first appeared in the November, 2006 issue of Analog Magazine. But, in on-line reviews it Descendent was often replaced by Descendant. Both words could equally be used for the story. So, to avoid ambiguity, I changed the name.